When Ice Cold in Alex was released in the United States in 1961, it was unrecognisable from the film that had made its debut in the UK three years earlier. The film was now called Desert Attack and it ran for a scant 64 minutes, meaning it had lost an hour of footage somewhere over the Atlantic. Of course, chopping the heart out of any film in such a manner is indefensible, but it seems particularly perplexing when you consider the nature of J Lee Thompson's classic war movie. This is a film in which every minute counts. We share every step of the epic journey the characters undertake and by the end of the film we are as exhausted as they are. Reviewing the gutted version in The New York Times in 1961, Eugene Archer wrote, "Suddenly, after practically nothing has happened, the bedraggled travellers arrive at their destination, talking mysteriously about their many arduous adventures and behaving as if they had just spent several years together on a desert island." What a shameful way to treat a great film. Ice Cold in Alex opens in Tobruk, a British Base in North Africa that has to be evacuated after coming under heavy aerial bombardment from Rommel's troops, and its story is focused on four characters who leave in an old K2 ambulance and head for safety, which lies on the other side of a vast desert. The group consists of Captain Anson (John Mills), a tired and alcoholic soldier, and Sergeant Major Pugh (Harry Andrews), who are tasked with escorting two nurses, Sister Norton (Diane Clare) and Sister Murdoch (Sylvia Sims). 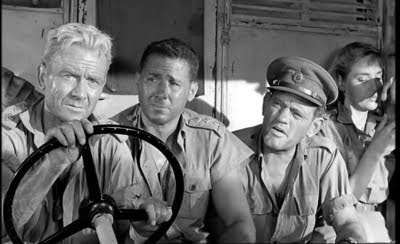 Along with the mysterious South African Officer van der Poel (Anthony Quayle), these characters are involved in a series of tense adventures as they attempt to reach Alexandria in Egypt. But there's one other star in this movie – the ambulance itself, nicknamed Katy by Anson, and as much of a character in the ensuing drama as the human leads. And what drama it is! Re-watching Ice Cold in Alex after so many years I found myself being gripped again by the expertly staged set-pieces that pepper TJ Morrison and Christopher Landon's script. There's a superb sequence early on that sees van der Poel taking an unwise step in a minefield, and the tension is orchestrated brilliantly by Thompson, with Gilbert Taylor's camera capturing every twitch and bead of sweat on the characters' faces. Ice Cold in Alex is an extraordinarily atmospheric film. The searing heat is almost tangible, as is the sense of fear, tiredness and thirst that the characters experience throughout their journey. Thirst, in particular, is a recurring motif, with Anson eagerly anticipating the drink he'll treat himself to when they finally reach Alexandria. We've all seen the famous scene, in which he finally knocks back a cool glass of beer, and few would argue that he hasn't earned it. This is one of John Mills' greatest performances. His Anson is a complicated, sometimes irascible figure, but one who stands as a great exemplar of courage and dignity under duress. His performance is a standout in a note-perfect ensemble, with all of the actors brilliantly detailing the gradually developing nature of their relationships, which gives the climactic scenes their satisfying complexity and intensity. Ice Cold in Alex is a true classic; a rousing, nerve-wracking and hugely rewarding adventure that deserves to be considered alongside the very best British war films. Quite why the American distributors thought it needed to be shredded and renamed before being presented to viewers over there is beyond my understanding, but those bemused audiences in 1961 don't know what they were missing. A small collection, but the interview with Sylvia Sims is a real pleasure to watch. During the course of twenty minutes she offers a number of amusing anecdotes and fascinating bits of behind-the-scenes info, as she happily discusses a film she clearly has an abiding passion for. There's also some interesting home movie footage that Mills shot during the production that provides us with an intriguing glimpse of activities on the set. Beyond all of that, the chief reason to buy Ice Cold in Alex on blu-ray is for the superb restoration job Optimum have performed on the film's picture. Ice Cold in Alex is available to buy on blu-ray now.